Many consumers are unfamiliar with eggplant, whether conventional or organic. Sales are growing, however, and were nearly 5% of the eggplant category in 2015. Cash in on organic eggplant sales by appealing to health-conscious, knowledgeable consumers. For more information on variety characteristics, visit our conventional eggplant page. Eggplant is a nutritious option that appeals to vegetarians. Promote it with other vegetarian items, such as organic tofu. Eggplant can also be cross-merchandised with organic frying batters and organic olive oil as it is tasty fried and stir-fried. Stuffing eggplant is a popular way to prepare it. Promote organic eggplant and organic squash with other organic stuffing ingredients such as meat and other vegetables. Organic eggplant grills well. Include it in summer grilling promotions and point out that it works well as a meat substitute. Consider displaying organic eggplant next to its conventional counterpart to create a larger display. Just be sure to appropriately separate the two types of eggplant. White organic eggplant is available so consider adding it to the display to broaden the options for your consumers. Organic eggplant is a soft vegetable so be careful not to stack it more than two layers high to avoid smashing the bottom layer. Organic eggplant’s deep purple color makes it an eye-catcher in the produce department. Place it next to a lighter colored vegetable like summer squash or tomatoes for an even more eye-catching display. Include plenty of preparation tips and recipes on your display as many consumers do not know how to prepare eggplant. 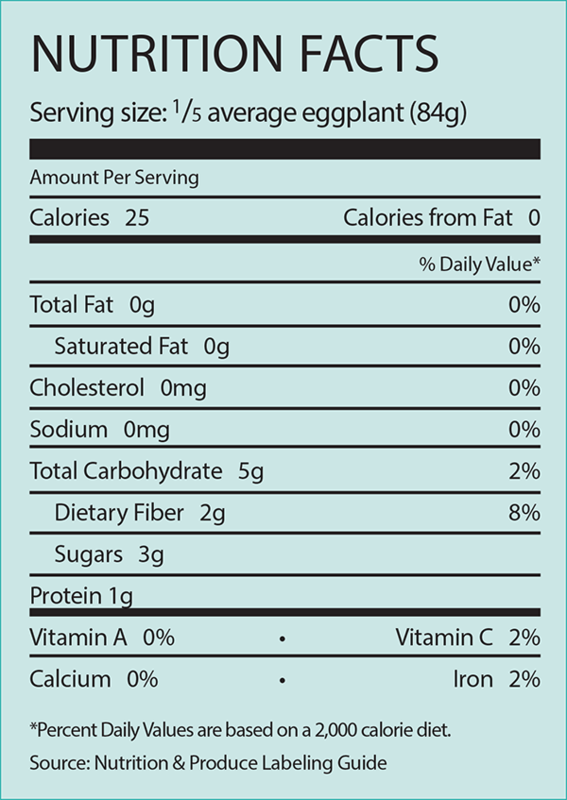 Organic eggplant is available in 18-24-count cartons. Japanese and white eggplant are most often shipped in 10-pound cartons. Odor sensitive. Do not store next to ginger or onions. Susceptible to chilling injury. Eggplant is sensitive to temperature extremes and requires a cool atmosphere to cut moisture loss. If left at room temperature for several days, produce becomes soft and wrinkled. Small scars on eggplant, commonly caused by wind, do not affect quality. 15% of consumers who purchased eggplant said they exclusively purchased organic eggplant. In addition, 18% of people who bought eggplant said they purchased both organic and conventional eggplant.